The MTNA Collegiate Chapter of the Year Award is named for renowned teacher and MTNA benefactor, Benjamin Whitten, for his financial support of the award. The award is presented at the MTNA national conference to the MTNA collegiate chapter that demonstrates excellence in its chapter activities. This honor recognizes the chapter’s commitment to the music teaching profession and MTNA. The state President nominates one outstanding collegiate chapter from their state for the award. 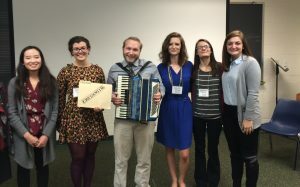 The MTNA Collegiate Chapter Forum (CCF) Chair, Chair-elect, and the Collegiate Piano Pedagogy Symposium Chair will take the lead in discovering what Chapters are doing via attendance at the Collegiate Piano Pedagogy Symposium in January, national conference collegiate sessions, and general communication with chapters throughout the year. Following the Symposium, the CCF Chair, Chair-elect, and the Collegiate Piano Pedagogy Symposium Chair will serve as the “Selection Committee” to determine the recipient of the MTNA Collegiate Chapter of Year Award. In lieu of a cash award, MTNA will provide travel funds for the selected chapter’s president or another officer to attend the national conference and accept the award. The purpose of the Collegiate Enrichment Grant is to provide financial assistance of up to $750 to MTNA Collegiate Chapters for the development of the Chapter’s presence in the community through projects offering educational and professional development for collegiate members, as well as support and promotion of music in the community. Visit the MTNA Foundation website for more information. The purpose of the Collegiate Travel Grant is to provide financial assistance of $100 to individual collegiate members to attend a national event, specifically the MTNA National Conference or the Collegiate Piano Pedagogy Symposium. Visit the MTNA Foundation website for more information. IMTA financially supports your attendance at an MTNA event as an investment in the future of MTNA. You may use the grant for any expenses related to the MTNA Conference or the MTNA Collegiate Chapters Piano Pedagogy Symposium and are not required to document your expenses with receipts. We look forward to having you represent the collegiate chapters of Indiana at one (or both) of these events. For questions regarding the IMTA Collegiate Chapter Travel Grant, please contact the IMTA Board of Trustees Chair, Claudia Bossard. See guidelines and submission details below. Note: As official members of the IMTA Board of Directors, Collegiate Chapter Presidents may also apply for travel grants to the MTNA National Conference from the IMTA Board of Directors Stickley Grant fund. The majority of your time should be spent at the conference or symposium. (You are welcome to do some local sightseeing if you wish, but you should spend the majority of your time at the conference events). Collegiate Chapters events such as the Collegiate Chapters Reception, Collegiate Chapters Forum, and other presentations by other collegiate chapters. For the Collegiate Symposium: Attend all relevant events. Submit a report about your experience at the Conference or Symposium to your collegiate chapter at a future meeting. Write a brief report/thank you regarding your Conference or Symposium experience for publication on the IMTA Website. Please submit this within one week of your return home to Lori Rhoden, the IMTA Collegiate Chapters Chair. In the event that you cannot fulfill these expectations, you may be required to reimburse IMTA for the travel grant. Also, if for some reason you are not able to attend the conference after the funds have already been disbursed to you, the funds will need to be repaid to IMTA immediately. Complete the IMTA Travel Grant application form below by November 15 of each application year. Late applications will not be accepted. If awarded this grant, you will receive a notification email from the IMTA State President no later than the end of November requesting you submit the necessary information to the IMTA Treasurer for disbursement of the travel grant. You are strongly encouraged to pre-register by the early registration deadline to obtain a lower rate. Please note however that funds will be made available no earlier than approximately one month prior to the event for which you will be attending. Are you currently or have you previously been an officer in your collegiate chapter? If so, please let the offices held and dates. Is this the first MTNA National Conference or Symposium you will be attending? Are you participating in any specific meetings, panels, or sessions at the conference or symposium? If yes, please describe.